Camping holiday enthusiasts who love travelling and want to enjoy the Italian coastline are sure to adore the location of and the luxury camping facilities at this site on Italy’s sun-kissed Adriatic coast. Booking your camping luxury mobile home at Stork Camping Village is simple and straightforward online. Early booking is recommended at this luxury camping site, where Lux-Camp offers mobile homes and other permanent accommodation. Camper vans or tents are not permitted. Luxury campsite with official 4-star classification, Wi-Fi and accommodation with mains power. Great location near the beach. Family-friendly facilities: modern bathrooms, baby changing rooms and washing machines. 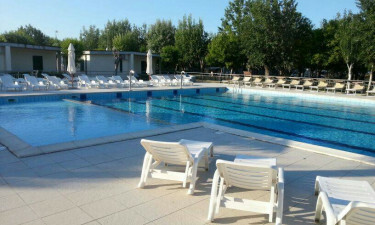 2 swimming pools, and sports facilities including a tennis court, table tennis facilities and beach volleyball. We know Stork Camping Village! At Stork Camping Village, guests can relax or enjoy a regular programme of entertainment and events. 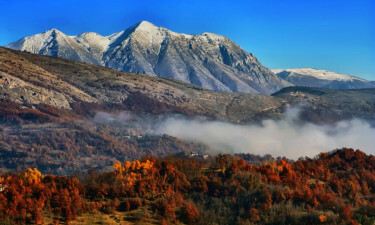 Alternatively, the Gran Sasso mountain range has the highest peaks south of the Alps, ideal for hiking, and just 60 kilometres away via the SS80 highway. A long, sandy beach and the clear blue waters of the Adriatic Sea are just a short walk along a tree-lined, shaded path – without any seaside parking problems or overheated cars. On the site, a large rectangular swimming pool is complemented by sun loungers, while a second, circular children’s pool offers shallow water for safe paddling. Sailing and surfing centres are just 3 kilometres away. Campers at Stork Camping Village have the convenience of an on-site supermarket, a shop with internet PCs, and a pizza restaurant.